I'm on tour this summer! 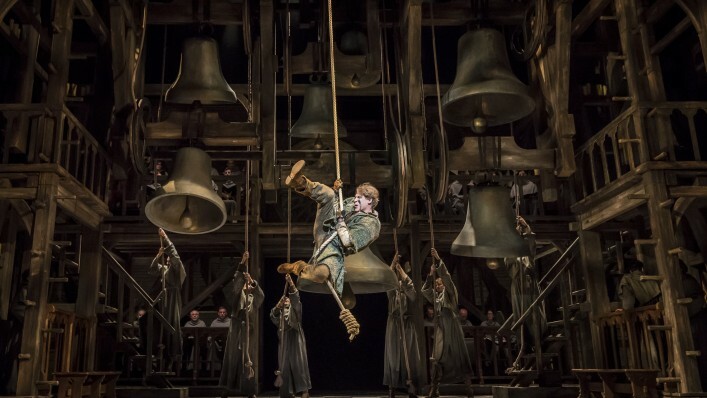 On tour with The Hunchback of Notre Dame, that is. Last weekend, I saw Stage Entertainment's Berlin production of the Disney musical twice, and next weekend, it's finally time to see the Danish production I love so much again. Before that, though, here's a review of the Berlin production. 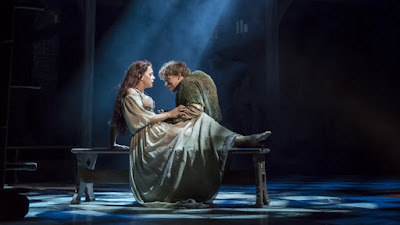 The Hunchback of Notre Dame the musical is based on Victor Hugo's classic novel and the 1996 Disney movie, with music by Alan Menken, lyrics by Stephen Schwartz, and book by Peter Parnell. Most of you probably know the story, but here's a quick recap: the year is 1482 and the city is Paris. The Cathedral of Notre Dame's hunchbacked bellringer Quasimodo, his adoptive father archdeacon Claude Frollo, and handsome soldier Phoebus all fall in love with beautiful Romani girl Esmeralda. The priest Frollo cannot deal with his forbidden feelings and thus sets forth a chain of actions that will change all of their lives (for the worse, and how! It's a complete mess). An earlier incarnation of the musical, with book by James Lapine, ran in Berlin from 1999 to 2002. After over a decade, the musical was revamped and the new version premiered in California in 2014. The new Berlin production premiered in April 2017 and it's a replica of the American original, directed by Scott Schwartz. All in all, it's no stereotypical Disney story with animal sidekicks and happy endings. 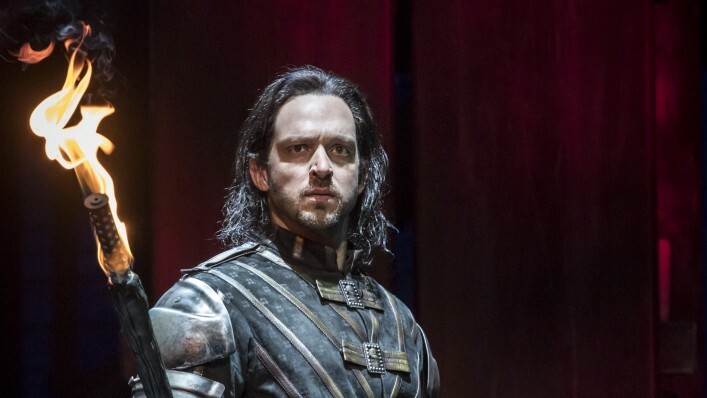 It's dark and heavy and very much in the spirit of Victor Hugo's original novel, and the show feels decidedly old-fashioned. The ensemble narrates the story throughout, and the production relies on rather simple (yet impressive!) sets and costumes. A choir of 24 is prominently featured onstage for the whole show. 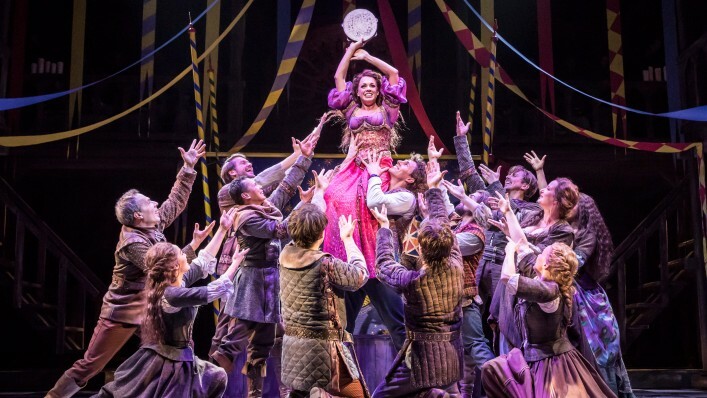 As they should be: the music, with its many Latin choruses, is some of the most impressive ever written for a musical. Some of the themes the musical deals with are prejudices and discrimination. That's something that sadly has to be highlighted in today's world, and certainly something that all of us have to pay attention to - I sure know I have work to do with my own prejudices, we all do. 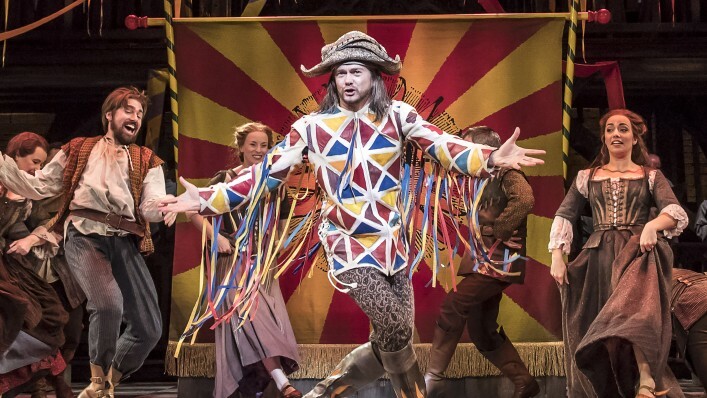 With that in mind, I think it should be noted that the musical's book and lyrics refer to the Romani characters with outdated terms that many nowadays consider pejorative. It's in line with Hugo's original writing, sure... but being an 19th century writer, he's hardly any shining example of modern racial sensibility. I've heard there's a foreign dub of the movie (can't remember which language!) that has Frollo using pejorative words and the "good guys" using the neutral terms. I wonder why they didn't do something like that in the musical. 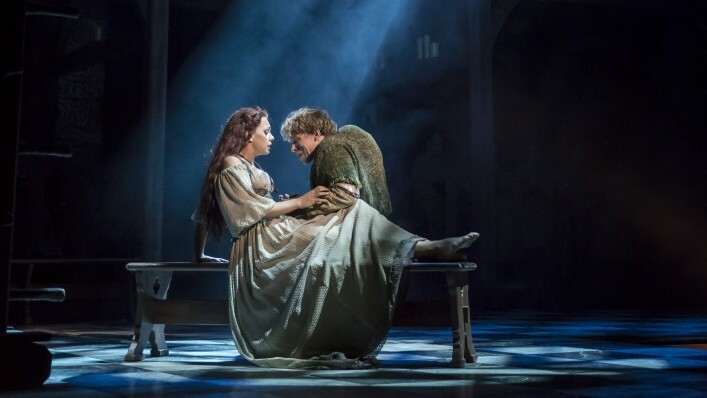 The show's heart is in the right place, but the details leave a little to hope for - just something to keep in mind while watching and especially discussing this musical. No matter what, though, I love this musical. In my ears, the music is perfect. The story is hardly subtle or especially realistic, and that's just why I enjoy it so. It's big in all the best ways and, at best, takes the audience on a journey of larger-than-life emotions and events. Yet it is not too removed from real life, and if you're not careful, it may even make you think... The characters are easy to love (or hate! ), but they can be portrayed with a lot of depth, and their relationships and inner motivations are endlessly fascinating to me. Good storytelling, that's what it is. I had the luck of seeing two different Quadimodos: understudy Jonas Hein and principal David Jakobs. I liked both a lot, but if I have to choose, understudy Hein takes the cake. His portrayal feels a bit younger, a bit more naive and a little sweeter and happier compared to Jakobs's, who in turn seems to have a little darker undercurrent running through his performance. Both sing beautifully and make you feel for the character. Both also absolutely nail the hunchbacked character's unique way of moving. So my opinion's just a matter of personal preference. Sarah Bowden's Esmeralda is both sweet and tough, with a voice that's enjoyable to listen to. Yet, somehow, she doesn't leave that deep of an impression. She's maybe a bit too much on the sweet and kind side for my tastes, it's just a tiny bit too sugary for me. Nevertheless, Bowden's Esmeralda is very likeable. A nice performance, but as a whole, not all that memorable. Felix Martin as Frollo is amusing, largely for the wrong reasons. To be honest, instead of a conflicted Catholic priest, he seems to be channeling a campy version of Count Dracula, chewing the scenery left and right. A total Disney villain! It's just that the musical's script allows Frollo to be portrayed as something a little deeper than a cartoon bad guy. Martin's portrayal of the character is pretty much straight-up evil, and while that's entertaining to watch, I still long for more shades of gray. Surprisingly enough, though, his obsessive attraction to Esmeralda is not overstated... or especially noticeable, even. Remembering how the rest of the portrayal was like, it feels odd there was no movie-style sniffing of her hair whatsoever! 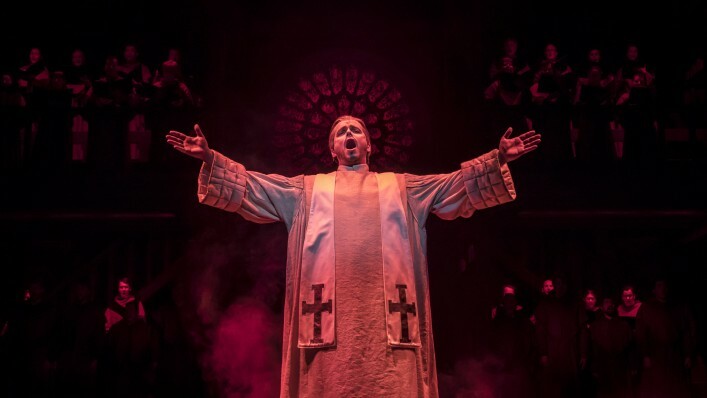 Luckily, Martin sings the part just right (the musical's whole score culminates in Frollo's solo Hellfire, so it would be a shame if he didn’t). And don't get me wrong - he's fun to watch. It's just that an approach like this gets old fast. Twice is quite enough for me. Jens Janke's Clopin, the leader of the Romani camp and a showman at the Festival of Fools, doesn't really do much for me. In the beginning, he reminds me of Jekyll & Hyde's Spider - a stereotypical, angry pimp, that is (though, to be fair, I suppose the script and the direction are largely to blame about that). I wish his and Esmeralda's relationship had a bit more warmth to it, since they're after all working together and supposedly on the same side of things. As a whole, Clopin's "master of ceremonies" persona doesn't feel all that charismatic or enchanting to me, it felt like Janke was aiming for over-the-top but didn’t quite reach it. I did start feeling sympathy for Clopin's "civilian" persona towards the end of my second performance's second act, though. And Janke does have an impressive falsetto! Maximilian Mann's Phoebus, then, is a real sweetheart. Watching the movie, I never paid much attention to the captain-of-the-guard-turned-rebel. But watching the musical now, it turned out I really like the character, if he's performed like this. Mann is a great fit for the role. His Phoebus is well-rounded and three-dimensional - from a ladies' man to a war veteran, then from a dreamer to an agitator, he feels real all the way through. Having such a likeable Phoebus makes you notice how the musical's Quasimodo-centric ending leaves the captain's fate in the air. I just want to know if he'll ever be okay again... Thank you, Maximilian Mann, for making me care about Phoebus this deeply! I also want to give big shoutouts to the ensemble and ORSO - Choral Society Berlin's choir, as well as the orchestra conducted by Bernhard Volk. They all sound fantastic together. I was maybe the most impressed by the choir, I think the choral Entr'acte is now my favourite piece of music in the whole show. Overall, somehow, I feel this production is slightly less than the sum of its parts. This should hit me harder, feel more exciting. Many times, I felt oddly disconnected from the story. Maybe it’s because I sat in the very back of the stalls both times and could hardly see any expressions. Maybe it's that both audiences I was a part of were surprisingly calm and quiet, and that affected the mood of the whole performace. Or maybe it's that the production's a replica and the direction would simply work better with the original cast and an American audience? Whatever the case, having seen the Danish production of the same musical, I know it can feel so much more engaging and exciting. The Berlin production is fine and beautiful, but hardly extraordinary. Both nights, though, the last ten minutes hit the audience hard. Quasimodo's fate and the final chorus punched me in the gut, and I was not alone: suddenly the formerly quiet audience was on its feet and cheering. Deep down, there's something very touching, very human about this story. I'd say it was well worth seeing both times.